Today our expert guest is Ande Lyons, Founder & Chief Possibility Officer of Possibility Partners. She mentors startup and early-stage entrepreneurs, while providing tools and resources to help them launch, brand, and build their businesses. 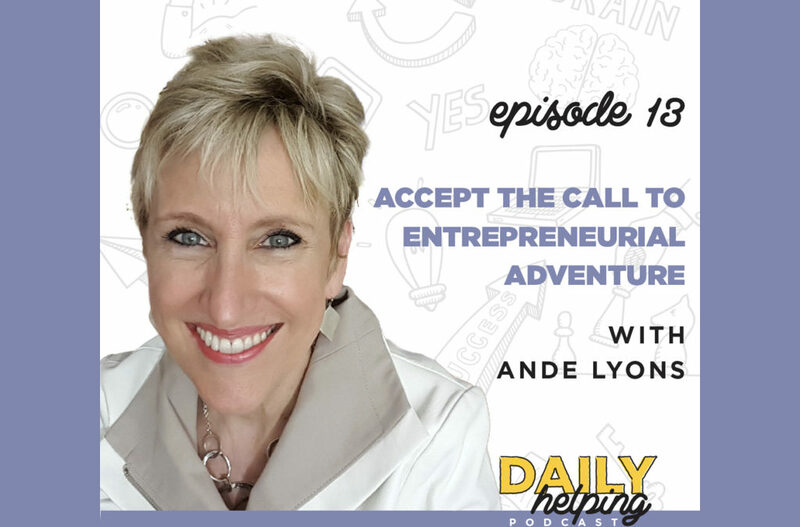 We discuss what the entrepreneurial “call to adventure” is, how she empowers entrepreneurs, and how you can build a business that succeeds. Ande’s core value has always been shining a spotlight and enhancing others, so she fits very naturally in the startup world. She’s able use her business to serve people, and help them be more positive, by bringing out their unique gifts and guiding them on the path to adventure. Risk and opportunity are inseparable, so being risk averse can prevent entrepreneurs from taking full advantage of their skills and opportunities. However, with help, you can learn how to stay focused on what you need to accomplish despite feelings of uncertainty. The entrepreneurial space is crowded, so you will be confronted with thousands of other people doing something similar to what you do. The only way entrepreneurs can differentiate themselves is through their brand promise, or the emotional connection between you and your audience.